Some uncertain boundary conditions play a key role for the stability and functionality of the rotor, as shown in Fig. 7.1. 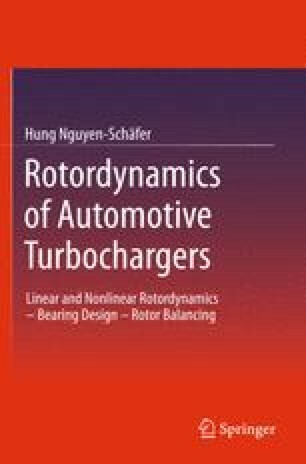 Unfortunately, it is very difficult or impossible to take all of them into account in the rotordynamic computation where only the rotor containing the compressor, turbine wheels, rotor shaft, radial bearings, and seal rings is considered. Normally, the boundary conditions are generally assumed ideal in the computation, such as sufficient supply oil, good parallelism of the thrust bearing, all wedges of the thrust bearing having the same slope, good quality of the radial bearing in terms of the bearing non-coaxiality, non-roundness, and characteristics of surface roughness. Therefore, the rotordynamic computation cannot cure the instability and malfunctions of the rotor, or prevent it from damages at inappropriate boundary conditions, like oil insufficiency, oil contaminated with hard particles, foamy oil, or oil coking in the bearing in the operation. However, the computational results help us better to understand the rotor response. Therefore, further improvements could be done for the rotor stability and reduction of the bearing friction. Additionally, experimental measurements also provide us with the real rotor response at such unknown boundary conditions that one could not consider in the computation.